Welcome back. I’ve got a fascinating topic, but before I begin, you’ll have to promise not to try to verify the findings of the research study I’ll be reviewing--you know, don’t try this at home, kids. Agreed? OK. The study found that daytime wounds heal faster than nighttime wounds. It’s all very logical when you realize that wound healing falls under the spell of circadian rhythms. Here’s the story. I wrote briefly about circadian rhythms in a blog post on the cause of Roosters’ Crowing. Circadian rhythms are physical, mental and behavioral changes that follow the 24-hour diurnal cycle and are found in most living things--microbes, animals and plants. 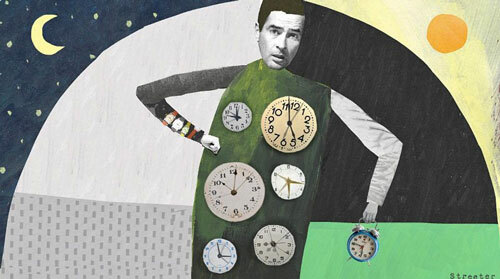 Circadian rhythms are produced and their timing regulated by each organism’s biological clocks. Note that “clocks” is plural. The biological clocks are composed of specific protein molecules that interact in cells in nearly every tissue and organ in the body. The brain synchronizes all those the clocks. Although natural factors within the body produce circadian rhythms, they’re also affected by external factors, especially daylight. Jet lag is one example of how altering the cycle can speed, slow or reset the body’s clocks as well as circadian rhythms. What Happens with a Wound? Ouch! You cut your finger (or scrape your knee). Fibroblast cells, which are responsible for making an extracellular matrix and collagen to help skin cells with the repair, waste no time in getting to the wound. Movement of the fibroblast cells relies on actin, a protein that, in addition to being involved in cell migration, shares the responsibility for forming the contractile filaments of muscle cells. To investigate the circadian influence on healing, researchers from the UK’s Medical Research Council’s Laboratory of Molecular Biology in Cambridge first led experiments with cells in lab petri dishes. They found fibroblasts filled scratches faster during the day than at night apparently because genes that control actin are more active during the day. They then found similar results in experiments with mice. Fibroblasts took twice as long to reach a new wound site if the wound occurred during the mice’s normal rest period of their 24-hour cycle than during the mice’s active waking period. Pursuing these findings further with humans, the researchers analyzed cases from the International Burn Injury Database. They observed that the time of burn injury significantly affected the rate of healing. Daytime wounds healed about 60% faster than comparable nighttime wounds. While the study extends our understanding of circadian rhythms and cell-based biological clocks, the authors emphasize the need for additional research. If the results are confirmed, how could that affect medical decisions? Should a patient’s circadian rhythm be considered when scheduling surgery? Can drugs be formulated to put a site of injury into daytime status? Interesting, no? Thanks for stopping by.